General Motors debuted two light-duty models this year and the all-new Chevy Silverado 1500 came in front of the public eye first at the Detroit Auto Show while flashier, new-generation GMC Sierra 1500 waited for the debut a bit longer. Again, two models share a lot of the DNA but GMC distinguished the new model further with more aggressive and flashy styling and a few unique innovations. The half-ton Sierra returns the high-luxury Denali trim but also stands out with the carbon fiber cargo bed option and new versatile, MultiPro tailgate. The new off-road focused AT4 is also available. The new-gen Sierra 1500 goes on sale with two V-8 engines initially while other options which should match the offerings of the twin Silverado 1500 will appear later. The 2020 GMC Sierra 1500 will likely fill up the promised engine offer while there won’t be other major upgrades. After the revolutionary redesign, the model can’t offer much more and new color combinations and some reorganization in the equipment offer could change for the new model year. The redesigned Sierra 1500 hasn’t departed from the twin Silverado model when it comes to the structure design and mechanics. The models share the stronger, high-tensile-steel-intensive chassis which comes in the combination with the mixed material body design. This now the common strategy in the auto industry not just for the trucks in order to provide greater capability and durability is also followed by better efficiency. Thanks to that the new Sierra is lighter up to 360 pounds and with the carbon fiber bed also saves 62 pounds. On the other hand, the styling is what makes the difference between the Chevy and GMC versions. The redesigned Sierra 1500 has a new, curvier and larger grille version between the new C-shaped headlights. The sharp edges also define the look of the new-gen, half-ton Sierra while the profile features softer sculpting than the previous generation. The available two-piece, versatile tailgate also makes the difference and the model has nice headlights. 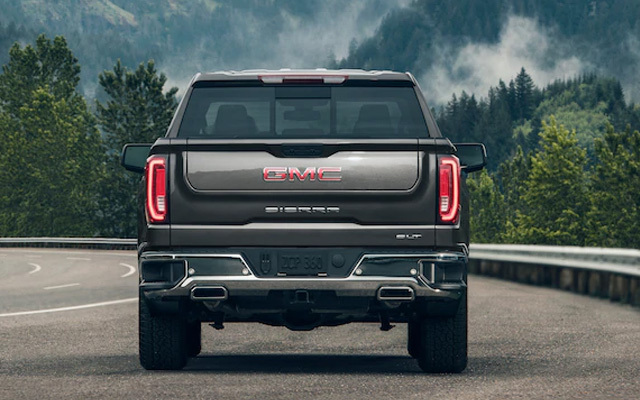 The 2020 GMC Sierra 1500 won’t change anything on model’s exterior design while new exterior theme and color options will likely appear. The truck will come with the different styling theme for almost every trim version and the wheels will size up to 22 inches in the top grades. The interior of the Sierra shares more of the design with the Silverado 1500 than from the outside perspective. The model adds, however, plenty of the unique touches and textures and more premium quality. The new-gen, light-duty Sierra is also more comfortable than the previous version and the crew cabs have an additional 3 inches of the rear legroom. The model is again available in three cab styles and the two-door regular cabs sit on the 126.5-inch wheelbase. The Extended and Crew Cab versions have longer 147.4-inch wheelbase. The next Sierra 1500 will again appear in the familiar trim range. The base version offers cloth upholstery, air conditioning, power locks, smartphone compatibility and options like the LED bed lights, keyless entry, power mirrors, etc. The gradual upgrades in upper levels will boost the material and texture quality as well and the level of the loaded tech. There will also be the appearance upgrades in upper grades and larger alloy wheels. The LED headlights will also appear with the more money spent as well as the leather upholstery, open-pore wood trim, an 8-inch touchscreen, heated and ventilated bucket seats and more. The truck will also come equipped with the advanced safety tech and systems such as the adaptive cruise control, lane keep assist, surround view cameras, blind-spot monitors and more. 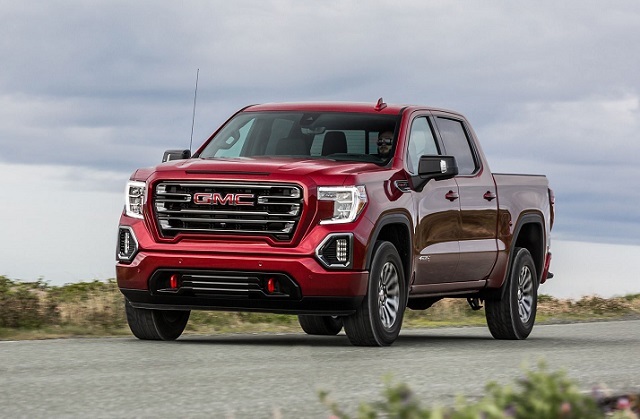 The 2020 GMC Sierra 1500 will mimic the engine range of the corporate twin and offer the six, eight cylinders, turbo-four and diesel engine options. The six-, eight- and ten-speed transmission options will also be on the equipment list. The 4.3-liter V-6 and 5.3-liter V-8 will be available with the 6-speed automatic transmission. The larger V-8 and also available 6.2-liter V-8 unit both have the Dynamic Fuel Management system. The smaller makes 355 hp and torque of 383 pound-feet. The 6.2L unit will deliver 420 hp and 460 lb-ft of torque. The 10-speed automatic gearbox will be in the combination with the most capable V-8. The light-duty Sierra will also offer the 2.7-liter turbo-4 and 8-speed auto transmission combination. The 3.0-liter I6 turbo diesel should also appear for the new model year with the 10-speed gearbox. The AT4 with the off-road upgrades and unique styling will again be the alternative for the rival off-road versions. The half-ton Sierra will tow up to 12, 200 pounds and allow up to 2.240 pounds in the cargo bed. The sales of the 2020 GMC Sierra 1500 version will start in late 2019. The prices will gain start around $33, 500 and go to high-50,000 in the most expensive version.